Mitchell Starc has arrived in Antigua after the IPL was wrapped up this week. Mitchell’s side Royal Challengers Bangalore made it to the qualifying final against Chennai Super Kings and they unfortunately bowed out of the tournament finishing in 3rd position. Overall the season was a success for both RCB and Mitchell as their was plenty of exciting and entertaining Cricket being played. 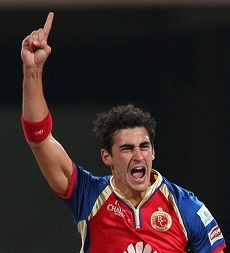 Mitchell missed the first three games of the competition due to a minor knee injury, he made an immediate impact upon his return to India claiming various man of the match and best bowling figures in a match for RCB. Despite missing the first three games, Mitchell finished the IPL as 5th leading wicket taker on 20 wickets, and amongst the top ten bowlers he finished 1st in bowling average on 14.55, 1st in bowling economy rate of 6.76 and 3rd in strike rate on 12.90. The left-arm speedster has now captured 62 wickets at the incredible average of just 14.6 so far this calendar year and is in career best form. This year has no sign of slowing down as there will be two Test matches played in the Caribbean against the West Indies which commence on June 3, followed by the Ashes series in The UK starting from early July.